End of Year Ice Cream Party! 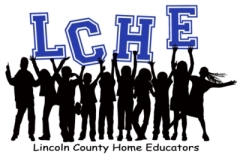 Lincoln County Home Educators, founded in 1988, is a growing local Christian support group in Lincoln County, NC of about 50 families. Our purpose as a group is to offer help and encouragement to area home schoolers and to provide educational, spiritual, and social activities for member families. LCHE is a diverse and inclusive group, and welcomes members regardless of ethnicity, faith, or marital status who agree to respect the Christian principles in the Statement of Faith (see Article VI of our By-Laws) and LCHE Guidelines for Activities and LCHE Teen Guidelines as approved by the Board (of our Guidelines). LCHE activities vary from year to year based on parental participation and leadership. Parent volunteers create, implement, and lead clubs based on a variety of topics, studies, and/or interests. PLEASE NOTE: Not all of these activities will necessarily be offered during the current school year. Some are confirmed, but we are always looking for more awesome parents to lead clubs & activities. Our wonderful members make LCHE possible and we thank you for you continued support. Some of the activities LCHE has offered are listed below. If LCHE sounds like a group you and your family would like to participate in, we’d LOVE to have you join us! Annual Membership is only $25. Membership dues support facilty rental fees, host classes & parties, buy supplies etc. All Returning Members please click to Renew your Membership. You will be prompted to login to your account. If you need assistance logging in Click Here to email the administrator. Membership dues cover August 1st through May 31st during regular school months. Interested in Joining LCHE? Click Request New Membership. Annual Membership is only $25 for All New Members. Membership dues cover August 1st through May 31st during regular school months. STEP 1: Complete the Request Membership link above to set up your login & you'll receive an email confirmation. STEP 2: Complete the Membership Form that comes in your confirmation email. STEP 3: Pay membership dues via PayPal or check. Details also included in the email confirmation. STEP 4: If you are joining the Teen Group, you must submit a Teen Group Form in addition to your Membership Form.